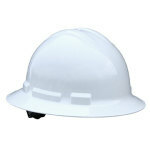 Molded rubber lining provides a soft, comfortable seal. Adjustable Neoprene head strap. 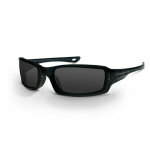 Perimeter ventilation allows air to flow around lens preventing fogging along with anti-fog lens coating. Clip attachment allowing for easy lens replacement. Additional safety lenses sold separately. Polycarbonate protective lens meets ANSI Z87.1+ standards. Provides 99.9% UVA/UVB protection. 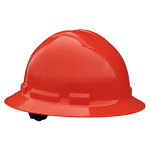 Description: Molded rubber lining provides a soft, comfortable seal. 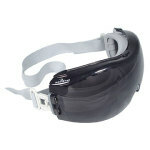 Adjustable Neoprene head strap. 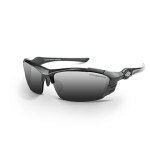 Perimeter ventilation allows air to flow around lens preventing fogging along with anti-fog lens coating. Clip attachment allowing for easy lens replacement. Additional safety lenses sold separately. Polycarbonate protective lens meets ANSI Z87.1+ standards. Provides 99.9% UVA/UVB protection. 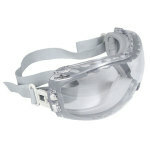 These safety glasses are ANSI Z87.1 rated and provide a rubber adjustable nosepiece and dual mold rubber temple grips to help prevent slippage. Sleek Full Frame Design for Maximum Protection. Rubber Nose Piece for all day comfort. 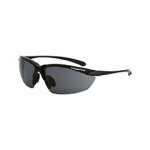 These safety glasses are ANSI Z87.1 rated. Lenses are also hard coated and protect your eyes from 99.9% of damaging UVB & UVA rays. 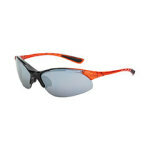 Crossfire M6A 20288 Safety Glasses with Hard Coated Black Mirror Lenses and Smoke Frames. 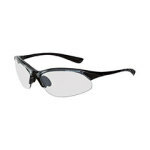 Rad-Sequel safety glasses have a lightweight design which provides a comfortable fit. 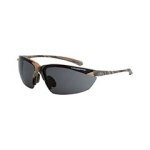 Rubber tipped temples and a soft rubber nose piece gives this glass a secure fit for all day wear. This style transitions easily to various environments for work or recreation. 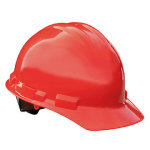 Made from tr90 frame material. Comfort fit rubber nose piece. Soft, non-slip rubber temple ends. 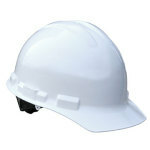 99.9% protection from harmful UVA and UVA rays. 100% visually correct de-centered lenses. Allows 18% of light to pass through. Lens quality and performance meet and exceed ANSI Z87. Silver mirror lens and shiny Pearl Gray half frames. 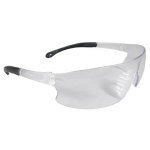 These safety glasses are ANSI Z87.1 rated and provide a rubber adjustable nosepiece and dual mold rubber temple grips to help prevent slippage. 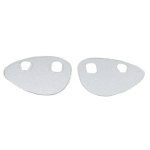 Fits Over Prescription Eyewear Temples – 2” X 1”. Does NOT Meet ANSI Z87.1 + Standards. Pillowed Bow Pad. Nylon Crown Stop Suspensions. Nape Cushion on Ratchet Suspensions. Vertical Height Adjustment. Quick Ratchet Adjustment. High Density Polyethylene Construction. Universal Accessory Slots. Pillowed Bow Pad. Full Profile, Full Brim. Nylon Crown Strap Suspensions. Nape Cushion on Ratchet Suspensions. Vertical Height Adjustment. Quick Ratchet Adjustment. High Density Polyethylene Construction. 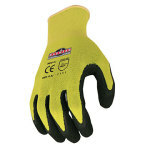 The Radians Radwear™ RWG10 Silver Series™ is a hi-viz knit dip glove with a15 gauge high visibility nylon shell. The elastic cuff provides a comfortable, slip-on fit while the micro-foam dipped latex palm provides durability and a slip-free grip. The Radians Axis level 3 cut protection dipped glove provides excellent protection against puncture, tear, cuts and abrasion. 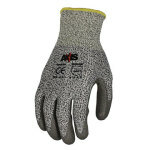 The seamless design of the 13 gauge, HPPE shell with the polyurethane dipped palm provides excellent protection and a comfortable fit in hazardous applications. Radians SJ21 Three-in-One Deluxe Bomber Jacket with black bottom has a zip out fleece jacket, concealed detachable hood, elasticized waistband and several inner and outer pockets. 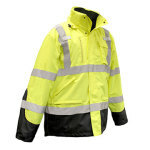 Safety jacket has 2″ silver reflective tape for high visibility. Description: The Radians SJ41 Class 3 Three-In-One Weather Proof Parka is wind and water resistant and comes with a removable inner fleece jacket for added warmth and protection. 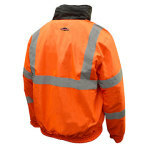 Hi-Vvz safety jacket has zippered pockets and pass through on back for fall protection. Radians Resistor 27 Earplugs has a reusable synthetic rubber which is hypoallergenic and can be washed with soap and water. Available with or without a cord. 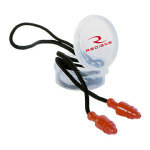 Radians Snug Plugs are reusable Jelli earplugs. Available with a convenient flip-top case for easy care and storage. Super soft, FDA approved material for comfortable hearing protection. 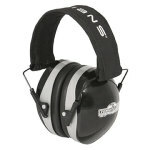 Radians Terminator 29 premium earmuff provides excellent protection with superior comfort. The adjustable, padded moisture wicking headband moves moisture away from your head to keep you cool and comfortable.